We marvel at how extraordinarily talented people create art that touches our lives and bestows so much beauty on our world. 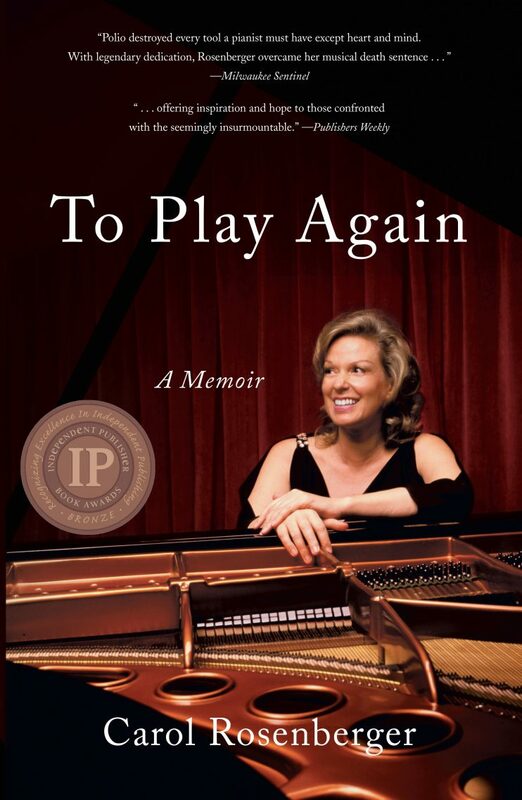 In her poignant memoir To Play Again, pianist Carol Rosenberger shares her inspiring life’s journey with all the promises such a story should possess, and is now a celebrated author of a 2018 IPPY Award. In all “Once Upon a Time” tales there is a hero or heroine who triumphs over some evil force with a most remarkable and courageous journey through to a “…happily ever after” ending. Such stories have the power to carry the reader to lands of mystery, love and loss, tragedy and triumph. Recalling our experiences with fairy tales, we know they model much more than right from wrong, they teach us life’s lessons – how to feel and how to be. They reveal many truths about the world – one being that it’s not always a fair and just place. To Play Again is a brilliantly written, eloquent and inspirational memoir. And like a symphony, each chapter is composed of stories so thoughtfully interwoven that they add to the masterpiece that is the human experience. To witness Carol Rosenberger’s heart wrenching story is to believe again in the enduring spirit of “dreams can come true” and that we can in fact “live happily ever after”. This story of remarkable resilience in the face of almost unbearable odds, will amaze, encourage, and bring comfort to all who travel life’s rocky and unpredictable terrain. Every society has its stories – and now we have Carol Rosenberger’s To Play Again – a lesson through her life in music, reminding us that anything truly worth having requires commitment and courage. She is a living example of how art can heal your life, and To Play Again is a story for us all! Carol was stricken with paralytic polio at age 21, and after 10 years of focused retraining and rebuilding she was able to resume her career as a concert pianist. Her story is an example of intense dedication illustrating how artists can “live inside their art”, take daring chances in performance while in a “flow state” and endure the rigorous process of healing to realize the ultimate victory. All Carol ever wanted was to be was a pianist, and in order to recover she had to disbelieve her neurologist who told her “whatever neuromuscular function hasn’t come back in another year’s time will probably not come back at all”. Since the motor neurons attacked by polio could never come back, Carol had to train the neighboring motor neurons to take over the job, and with the help of creative physical therapists, develop new neural pathways to compensate for those that were lost. Of course, nobody understood the concept of neuroplasticity some 50 years ago, and Carol’s neuromuscular miracle occurred way ahead of scientific understanding and medical intervention. She was compelled to heal herself by her singular passion for the piano, along with her determination to live her life as planned, despite the ruin left in her body and brain by polio. Today, neuroimaging studies of creative individuals have shown that musical practice and performance can produce noticeable changes in brain structure and function. And it is because of neuroplasticity that one is able to recover, at least to some extent, from devastating brain injuries. Carol shares how eventually playing the piano in informal performances for small groups of friends, and by embracing the “magic” that happened in a flow state, enabled her to learn to play the piano again, and resume concertizing and making over 30 recordings for Delos Records. Carol tells us “… without those performances, the advice that I should turn away from piano playing and resign myself to following a different life path would have been accurate”. 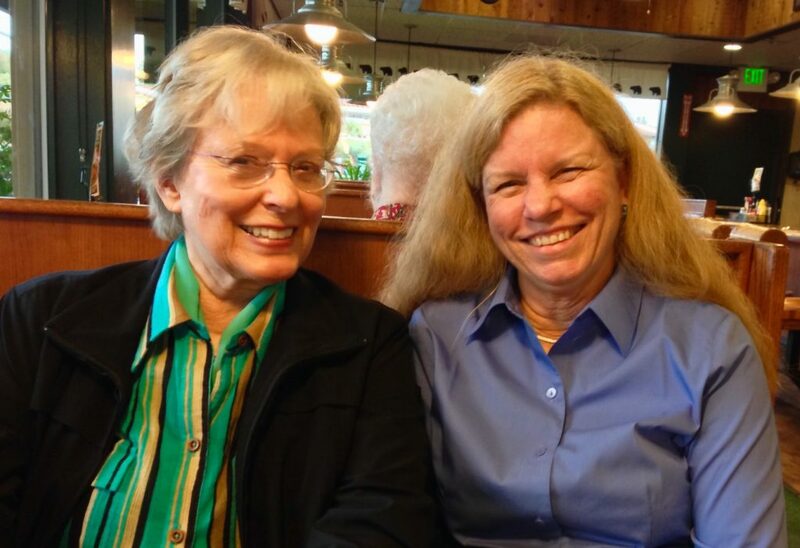 Carol expresses her deep gratitude for the great gift of friendship given to her by Amelia Haygood, the founding director of Delos Records, to whom Carol dedicates To Play Again. We understand that a story only begins to live when it goes out into the world of its readers: how it makes you feel, what possibilities it inspires, what dreams it ignites. To Play Again, is Carol Rosenberger’s gift to us all, as the alchemy between content and the subjective experience of reading her story lives on long after the ending. Her journey compels us to once again believe in the impossible simply because we must. Reading her story is life giving, but along with her book, you must also listen to her music! Her passionate piano playing soothes the imagination, but also reminds us of how fragile life can be – yet somehow we can endure. Early in her rehabilitation process Carol described having “glorious Technicolor dreams” about playing the piano in performance again, and how she “would awaken … still feeling myself playing the piano effortlessly, bringing the musical message to life with all of the skill and imagination I had ever possessed”. And she described her lifetime bonding with her instrument: “The piano was fused with my very core; it meant life itself to me”. There are many metaphors that describe the miraculous powers of healing in Carol’s story – particularly the remarkable support of deep friendships, the unfailing belief in oneself, and the healing power that beautiful music can bring. In this healing process we seek to restore harmony within ourselves so we can rest. Carol describes how she still discovers beauty and joy through playing the piano almost daily, and is reminded that music never fails to inspire her along her way. She knows that art can heal one in unpredictable ways, and that we can know a “happily ever after”. To Play Again is Carol Rosenberger’s story – it can inspire true believers that hope smiles from the edges of courage, whispering the promise that “dreams can come true”. It’s no surprise that the Independent Publisher Book Awards for 2018 (IPPY Awards), who honor the year’s best independently published titles from around the world, found her memoir to be a most deserving winner. Brava Carol!